Marco Baldi is busy working on Alba Berlin’s connections with China and Borussia Dortmund. 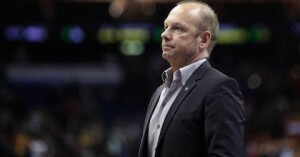 Munich (heinnews) – Alba Berlin have been building up their relationship with China and have even talked about bringing over young Chinese players as a possible next step, according to club general manager Marco Baldi. The Alba Berlin leader also spoke to Taking The Charge about the cooperation with Borussia Dortmund and how they are studying how the German football/soccer giants is structured and push their brand. Berlin’s endeavour into China began in 2011 when they held their first training camp in the country. Since then, Alba have come up with a number of programs, ranging from the school and university level to federations and companies. In September 2014, Berlin announced a three-year deal with the Chinese ZhongDe Metal Group as the jersey sponsor for the club and its second main sponsor. The group – whose name translates to Chinese-German Metal Group – was founded in 2012 to build a German-Chinese eco-model city in Guangdong in southern China. German and Chinese companies are sharing their know-how to build a city in which about 100,000 people will live at high environmental standards. “We have tough opponents and we have to see how to find our way. We don’t have a president or owner who just puts in money as long as it’s worth it or Bayern Munich which is a big club with a big image and they can go their way with that. We have to find our way,” Baldi said. Since first going there, Berlin have organised regular tournaments, camps and training programs at international schools in Beijing, Shanghai and Hong Kong. And there is an annual German-Chinese student tournament held in Berlin. Baldi also said the club has started a cooperation with the Guangdong Southern Tigers which is one of the most popular and successful teams in China with eight CBA titles between 2004 and 2013. “We exchange at all aspects of basketball – athletic programs, preparation periods, youth programs but also marketing, ticketing and so on. And it’s worked. We brought a sponsor from China with whom we are collaborating,” said Baldi, whose club opened an office in Beijing in July 2015. Baldi said Alba plan on expanding their connection with China, including trying to attract more German companies to invest in the eco-city. Baldi believes more likely would be young Chinese players coming into the Berlin youth system. Baldi also talked about another interesting collaboration the club has had since July 2015, when Alba and eight-time German football champions Borussia Dortmund presented plans to cooperate in numerous areas. “This is one of the highest developed clubs in Europe. Of course soccer is a different sport and a different environment. There’s a lot more money in the market and so on. But we can learn things from them: how their club is structured, the way they’ve built their brand, how they work consistently with their brand values,” Baldi said. “There are interesting areas, also in social media where we want to link up with them,” Dortmund marketing boss Carsten Cramer said at the time of the announcement. While Berlin can help Dortmund get their foot in the door in China, Dortmund can assist Berlin in marketing, television contracts among other areas.